If you have lots of MP4 files and Roku 4 device, chances are you want to play all mp4 files on Roku 4. When you try to do this, you'll find it's very difficult to do the job. Well, can Roku 4 play MP4 files? Keep reading the following page is my answer. >> Apple TV 4 vs Roku 4. Roku 4 supports a wide variety of codecs and media types, but if you try to play a file that contains unsupported content, Media Player will notify you about the issue. For example, you'll probably meet the issue that not all of the MP4 files are supported on Roku 4. The basic reason is that different MP4 files have different video codecs and the codecs might not be compatible with Roku 4(It can only support H.264, MPEG-4). To view incompatible MP4 files on Roku 4, an ultimate solution is to convert MP4 files to Roku 4 more friendly formats, and then transfer the converted files via the DLNA server. Therefore,A top-One MP4 to Roku 4 converter is needed. Actually, it's easy to get the job done as long as you get Pavtube Video Converter Ultimate. This video converter has been proven to be an outstanding MP4 to Roku 4 converter. It has the ability to convert Blu-ray, DVD and MP4 to Roku 4/3/2 friendly MP4, MKV without quality loss. In addition to converting MP4 to Roku formats, it can also convert among more than one hundred videos formats including AVI, MXF, MTS, MVI, FLV, MOV, WMV, VOB, MKV to Rokusupported video formats. Here is review. Besides that, It supports to convert multiple video formats to another format for popular portable devices with fast conversion speed without any quality loss. And you can edit the videos such as merge multiple videos into one, trim, crop, add watermarks including image, text and videos and so on. For Mac users, iMedia Converter for Mac is a helpful app to encode MP4 videos to Roku 4for further usage. Step 1. 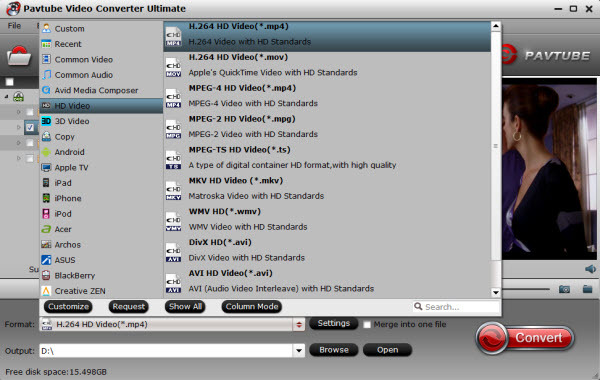 Import MP4 files to Pavtube Video Converter Ultimate. Click "Add Video" button to import original files or drag and drop the original MP4 files to the software directly. You can also Load MKV/M2TS/FLV/WMV/F4V etc. Note: You can also Click "Load files(s)" to import DVDs and Blu-rays. Note you need to have an external Blu-ray drive if you want to rip Blu-rays. Keep Internet connected during importing. Step 2. Choose format for streaming via Roku 4. Click "Format" dropdown list to choose "MKV HD Video (*.mkv)" or "H.264 HD Video (*.mp4)" under "HD Video" option as Roku 4 compatible video. 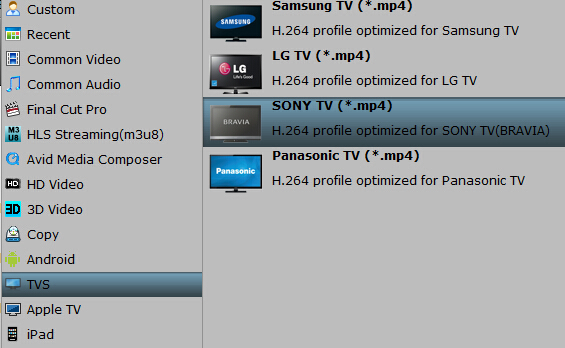 H.264 MP4 will create high quality files and generate big file size. If you need a smaller file, "MPEG-4 HD Video (*.mp4)" is also offered. Tip: Click "Settings" button to adjust video and audio parameters like bitrate, size, audio channels, etc to meet your requirement. Step 3. (Optional) Edit videos. Step 4. Convert MP4 Videos for steaming. Click "Convert" button to start converting your MP4 for streaming to Roku 4 via Plex. If you do not like the default path for output files, you can click "Browse" button to find a new folder before conversion. Once the conversion is finished, click "Open" button to get the generated files quickly.